Gené, C. G. 1836: De quibusdam Insectis Sardiniae novis aut minus cognitis. [Fasciculus I.]. Memorie della Reale Accademia delle Scienze di Torino, Torino 39: 161-199,  Taf. (Fig.1-29). Gené, C. G. 1839: De quibusdam Insectis Sardiniae novis aut minus cognitis. [Fasciculus II.]. Memorie della Reale Accademia delle Scienze di Torino, Classe die Scienze Fisiche, Matematiche e Naturali, 2. Ser., Torino 1: 43-84, Taf. I-II. Most of Gené’s insect collection is in Museo Regionale di Scienze Naturali di Torino, with duplicates being deposited in the Museo Civico di Storia Naturale de Milan and in Museo storia naturale di Pisa. However, some of his insect specimens are believed to be lost or destroyed. For example, in the recent revisions of the genus Chelotrupes (a dor beetle) by Dellacasa and Dellacasa (2008) the authors were unable to find the original specimen(s) Gené used to describe Chelotrupes hiostius and so designated a neotype (a new type to replace one that is lost or destroyed). Hillert et. al. (2012) followed this in their review of the genus Chelotrupes. The department provided the type specimen of Chelotrupes momus (Fabricius, 1792) for the Hillert et. al. (2012) work on the genus, and when the paper was recently sent to us along with the returned loan of our specimen, we noted the ‘lost’ Gené specimen cited. We knew we had some of Gené’s specimens in Oxford, but the value and extent of this collection had not been realised. Gené corresponded with our founder Frederick W. Hope (1797-1862) and in our archive collection there are letters to Hope dated 7th March 1835, 25th February and 24th October 1837 and June 1844. 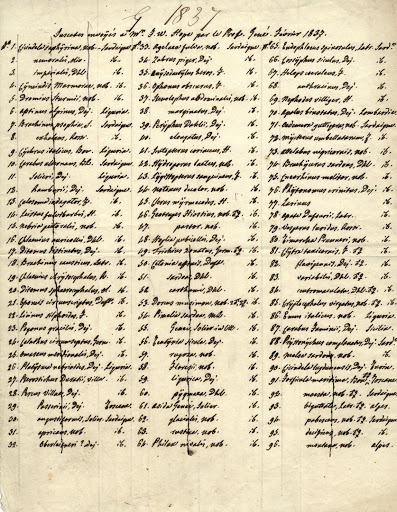 The most interesting archive (dated 1837) was a list of ninety-six Insects from Sardinia that Gené sent to Hope. In which, several of the new species, identified in the list by having ‘nob’ after their scientific name, which is shorthand Latin for nobis– which translates as ‘belonging to me’, and was used by authors to designate their new species. In this list was Geotrupes hiostius (as Gené called it). After the discovery of this archive we searched the collections and found the ‘lost’ type of Chelotrupes hiostius (Gené) in our dor beetle collection. An amazing discovery for us, as this specimen’s scientific importance had not been recognised for over 170 years! We have looked for a further two specimens from this list, and have found both, one Oil Beetle and a Stag Beetle. We hope to spend some time over the summer to see how many more from this list we can find! Dellacasa M. & Dellacasa G. (2008). 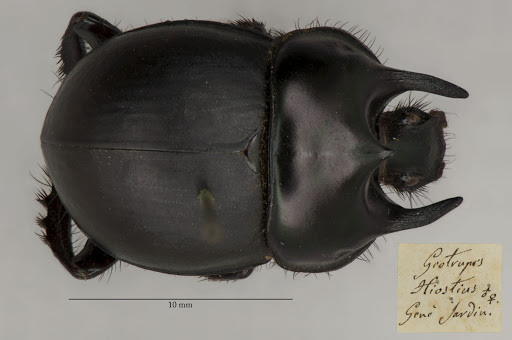 Revision of the genus Chelotrupes Jekel, 1866 n. stat. (Insecta, Coleoptera, Geotrupidae). Zoosystema 30 (3): 629-640. Hillert, O., Kràl D. & J. Schneider. (2011). Revision of the European genus Chelotrupes (Jekel, 1866) (Coleoptera: Geotrupidae: Chromogeotrupidae). Acta Societatis Zoologicae Bohemicae 76: 1-44. For more information about Gené please use the following links. Taxonomy as subject, or rather how and why we name things the way that we do, is one of those tricky things that we get asked about all the time. It’s a tricky thing because really there is so much that we could talk about we often don’t know where to start. Of course, asking us is a bit like asking a 5 year old polar bear enthusiast to tell you why they like polar bears- soon you will know everything there is to know about polar bears and probably a bit more on top. It’s the same with us and insect related questions, we just can’t help but get over-excited and try to tell you absolutely everything there is to know. Considering that there are over million described insect species and hundreds of years of history to taxonomy, collections, museums and science it’s not surprising that staff can still be talking days after you ask your original question. 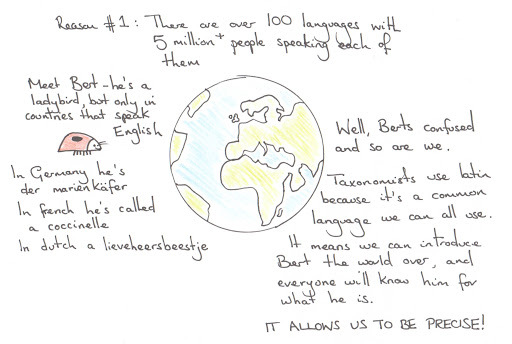 Latin is a universal language. It doesn’t matter which country you are from or what language(s) you speak, using a latin name for a species allows you to be precise about the species you are talking about, so if a researcher in Spain communicates about a species with a researcher in Malaysia they know that they are both talking about exactly the same thing. 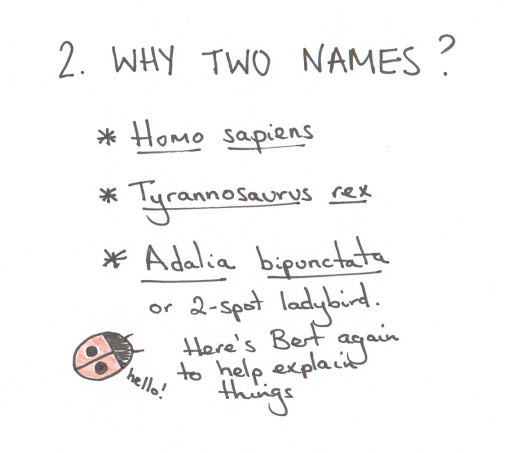 Sometimes, species end up with multiple common names. 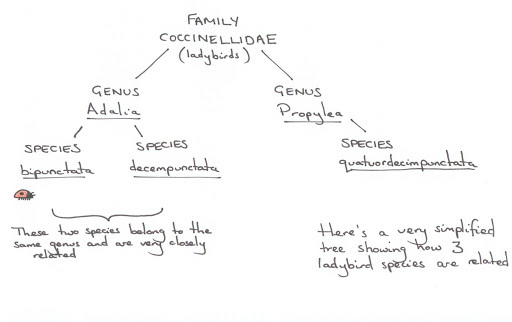 There is no code or list of rules for giving a species a common name (which there is when it comes to latin names) and so some species end up with lots of different names. Ladybirds are variously known as: lady bugs, lady beetles, god’s cow, ladyclock, lady cow and lady fly among others. Various taxonomical systems have been employed in the past. 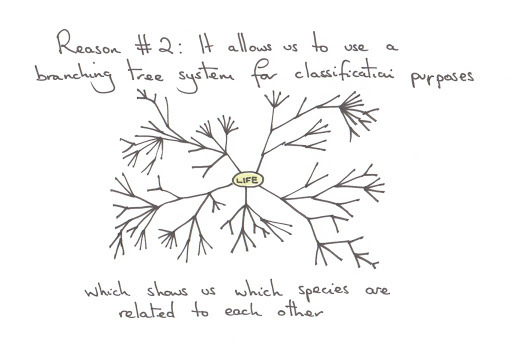 The binomial system (2 names) as refined and perfect by Carl Linneaus is the one that is now used by taxonomists. A trinomial name system (3 names for a species) was in existence for a while but it was found to be too cumbersome, as were a few other systems that we will touch on in future posts. The other advantage to using a binomial system is that it lets you reuse specific names for multiple species across different genera. 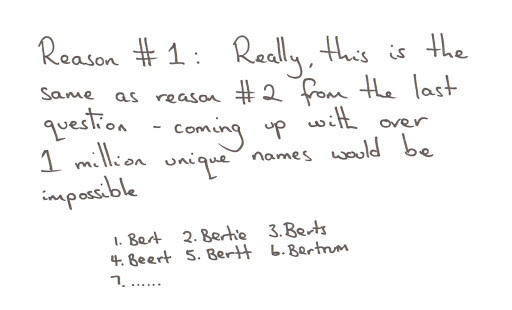 The rules do not allow for generic names to be used more than once so you can never completely duplicate a name. For example all the following species have a specific name of punctata but belong to different genera, hence you can differentiate between them: Platythyrea punctata (an ant), Phyllorhiza punctata (a jellyfish), Drepane punctata (a sicklefish) and Tangara punctata (a bird). 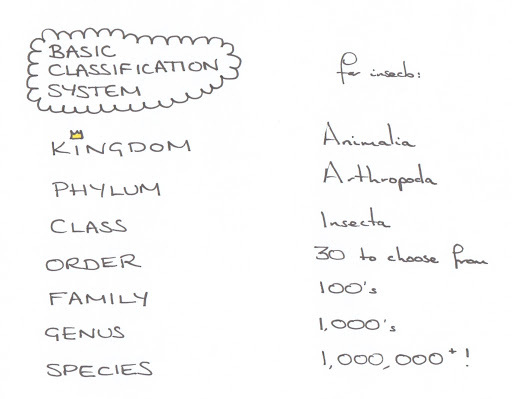 Taxonomical systems are all based on the above format. Levels within a system vary depending on the subject, for example, a zoological structure dealing with mammals has a higher level structure, plant structures are complicated by hybridisation and insect based trees have an extraordinarily high number of branches due to the sheer volume of species involved. Further levels are available to a taxonomist than those above. 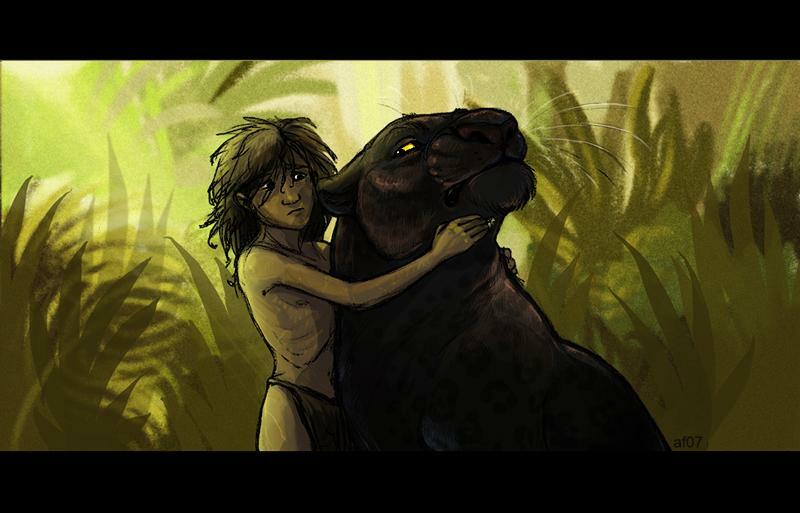 There are both super- and sub- levels for each category (super-family or sub-order for example) as well as extra levels such as tribe which is inserted between family and genus. In fact, there are multiple variations around a theme and all of these structures are flexible. A classification scheme is merely something that is imposed on nature by humans as a way of grouping similar species together. Each levels creates a group of a greater or lesser size. Those at the top of tree (kingdom, phylum) create the biggest groups with each group becoming smaller as you move down the list until you reach species level which classifies to a single unit: one species. The information in this post has been boiled down to the basics. We will cover things individually and in more depth in later posts, when we can take a look at separate issues and discover more about how taxonomists set about sorting out and identifying species, describing new insects and establishing type specimens. For now though, we hope that you have enjoyed meeting Bert the ladybird. If you have any more questions for us then please post them in the comments box below or e-mail us using entomology@oum.ox.ac.uk. Once a year, on the first Wednesday of every March, when the weather is especially chilly (or so it seems), entomologists can be seen flocking towards the bright lights of London. As they wend their way towards South Kensington you may be forgiven for thinking that there is some kind of mass migration going on, and it’s true, entomologists do often seek warmer climes than Britain may have to offer, if only because of the abundance of insects is so much greater in those areas of the world where it is hot and sticky (and if there is one thing that entomologists cannot refuse, it’s an abundance of insects). But on this occassion you would be wrong. For the first Wednesday of every March is devoted to the Verrall Supper. 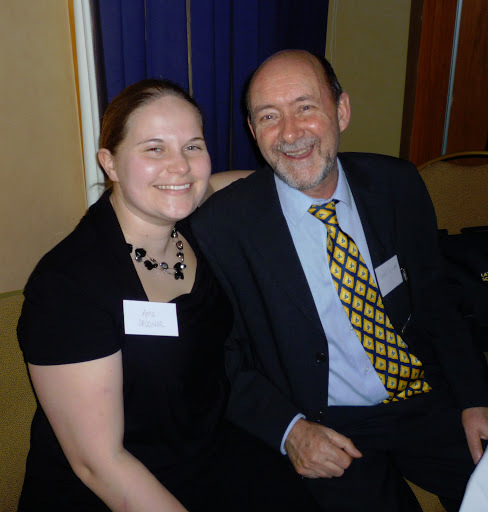 Arguably the highlight of the social calendar for all entomologists, the evening consists of a lecture, hosted by the Royal Entomological Society and presented by a distinguished entomologist, which is then followed by drinks, dinner and much socialising. 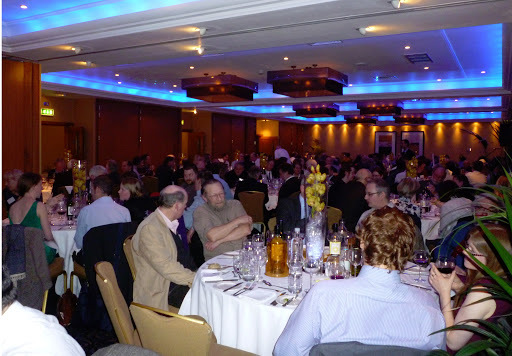 This year the dinner was hosted at The Rembrandt Hotel which is a short stroll from the Natural History Museum. Staff from the HEC left Oxford early in order to spend some time in the collections in the NHM, checking type specimens and doing a little research as a form of pre-dinner exercise just to sharpen our appetites. 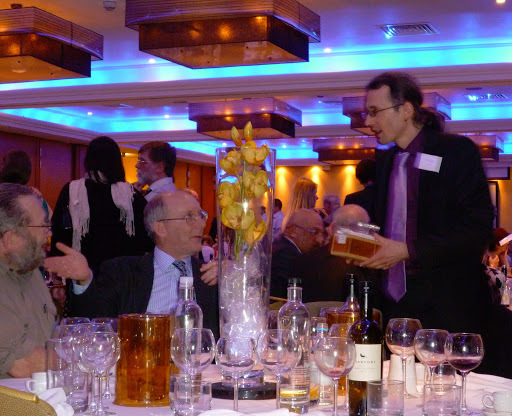 The Rembrandt Hotel was a new venue for the Verrall Supper which for the last 10 or more years has been held at Imperial College. It proved to be an excellent setting although it seemed to take everyone a little while to get used to the idea that the tables were round instead of the long bench style table at Imperial that seat about 60 people. This new format made mingling with other guests between courses much easier however and it has to have been one of the chattiest Suppers that any of us have to been to in a while. Of course, the fact that there was 183 collected entomologists (a recent high in attendance) in the room might also have played a part. What’s the collective noun for entomologist’s? A colony? Maybe a rabble? Cluster? Army? Clutter? Intrusion? Answers in the comments box below! 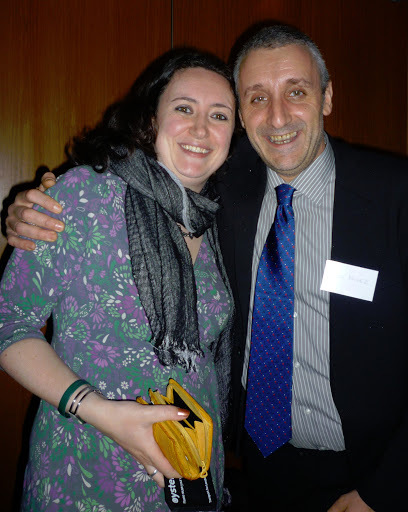 Amoret Spooner and Mike Wilson, Head of Entomology at National Museum, Wales. Darren Mann (right), talking to Charles Godfray (left), Hope Professor, Oxford. One other notable change was the increase in the number of people documenting the ocassion. Social media is fast becoming a part of peoples daily lives so it wasn’t too much of a surprise to find that the Verrall Supper had acquired it’s own hashtag on Twitter or that photos of the dinner appeared within minutes of the courses being served. If you would like further information about the history of the Verrall Supper or the Entomological Club through which the supper was established then there is an excellent publication on the subject by Pamela Gilbert. Gilbert, P. (2005). The Entomological Club and Verrall Supper: A History (1826-2004). The Entomological Club c/o The Royal Entomologists Society. Headley Brothers Ltd, Kent. Honorary Associate Dr George McGavin and Assistant Curator Darren Mann of the HEC will both be putting in an appearance on the BBC Radio 4 program ‘The Etymology of Entomology‘ which is being broadcast this Saturday, the 9th of March at 10:30 (BBC Radio 4 FM: 92.5–96.1). “Zoologist Dr. George McGavin delves into the strange and often bizarre names given to the planet’s insects. 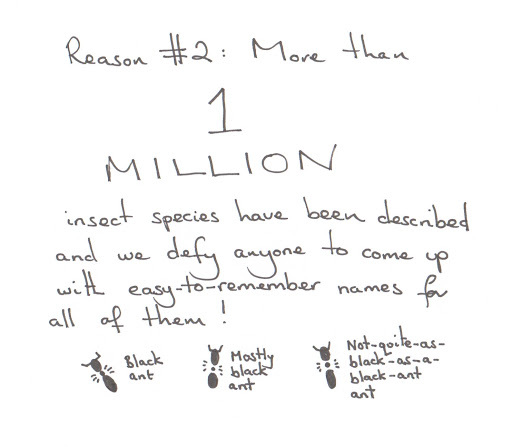 There are an estimated 10 million living insect species, with new specimens being discovered almost daily. Entomologists are turning to ever more imaginative names, referencing everything from literary figures, celebrities and politicians to playground puns. George takes us into the complex and intriguing world of the taxonomist. From the 18th century father of modern taxonomy Carl Linnaeus to the present day, he explains why naming the things that surround us is the foundation of all science. Preseucoila imallshookupis is a species of gall wasp named after Elvis Presley. Agra schwareneggeri is a species of carabid beetle named after Arnold Schwarzenegger. Bagheera kiplingi is a species of jumping spider named after Rudyard Kipling and his character Bagheera the panther from ‘The Jungle Book’. Tianchisaurus nedegoapeferima is an ankylosaurian dinosaur. The species name ‘nedegoapeferima’ is formed from the first two letters of the surnames of the main stars of the film ‘Jurassic Park‘. 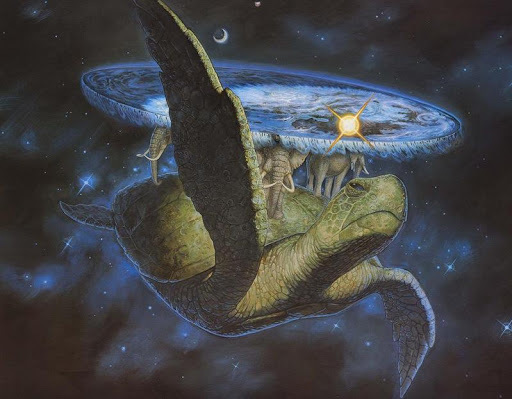 Psephophorus terrypratchetti is a species of Eocene turtle named after the author Terry Pratchett who wrote the ‘Discworld Series’ which is set on a world that is carried through space on the back of a giant turtle. EDIT: An article about the radio show has now appeared on the BBC News website in the Science and Environment section.